Just today we received unfortunate news that United Pet Group is voluntarily recalling multiple brands of rawhide chew products for dogs due to possible chemical contamination. This recall was initiated after United Pet Group identified that certain rawhide chew manufacturing facilities that are located in Mexico and Columbia, in addition to a supplier in Brazil, were unfortunately using a quaternary ammonium compound mixture as a processing aid in the manufacturing of these rawhide dog chew products. This compound is an anti-microbial compound that while it is approved for the cleaning of processing equipment, it has not been approved as a processing aid in the production of rawhide chews for dogs. Below is a list affected products that have been subject to the recall. 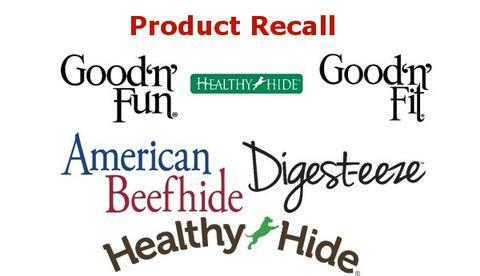 All of the dog chew products included in the voluntary recall identify an expiration date ranging from 06/01/2019-05/31/2020. While we do not sell these products at Paleo Pet Goods, we want to warn our customers who may purchase these products from elsewhere. Please be cautious when purchasing any products with these titles in their description. If you have any questions or would like further information regarding this recall please do not hesitate to contact us directly!